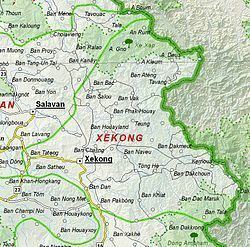 Sekong (also sometimes Xekong, Lao ເຊກອງ) is a province of Laos, located in the south-east of the country. Sekong Province is the second smallest province in Laos and also one of its poorest, covering an area of 7,665 square kilometres (2,959 sq mi). It is bordered by Vietnam to the east, Attapeu Province to the south, Salavan Province to the north, and Champasak Province to the west. Sekong also has the smallest population (113,048 as of 2015) and the lowest population density of any province. It was created in 1984 by splitting the Salavan Province and is the most diverse province in Laos with 14 ethnic groups. The Sekong River, which divides the province, flows in a southern direction into Cambodia and is navigable for boats. The river valley has fertile plains interspersed with paddy fields and fruit orchards. Its rich tropical forest have many rare species of flora and fauna. The Dakchung Plateau and Xe Xap National Biodiversity Conservation Area are among the areas under protection. Unlike most of Laos, not many wats are seen in the province as the predominant belief system is more of animism and ancestral worship. Sekong Province is one of the most important coffee producing areas of Laos. Sekong was created in 1984, when it was split off from Salavan Province. and Attapeu Province. After it became a separate province, it has become ethnically a most diverse province in Laos with 14 ethnic groups reported from a population of 85,000. Since these groups are not Buddhist not many wats are seen in the province as their belief system is more of animism and ancestral worship. During the communist regime, the province was created to give benefits to the local ethnic groups. However, this advantage seems to be on the decline with ethnic Lao groups dominating the political scene and also in the local administration. 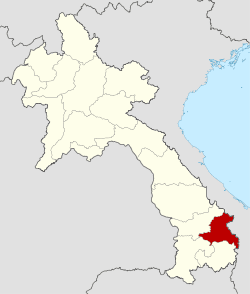 Sekong Province, one of the provinces in Laos, is the second smallest province, covering an area of 7,665 square kilometres (2,959 sq mi). It is bordered by Vietnam to the east, Attapeu Province to the south, Salavan Province to the north, and Champasak Province to the west. Sekong also has the lowest population (about 83,000) and the lowest population density of any province. 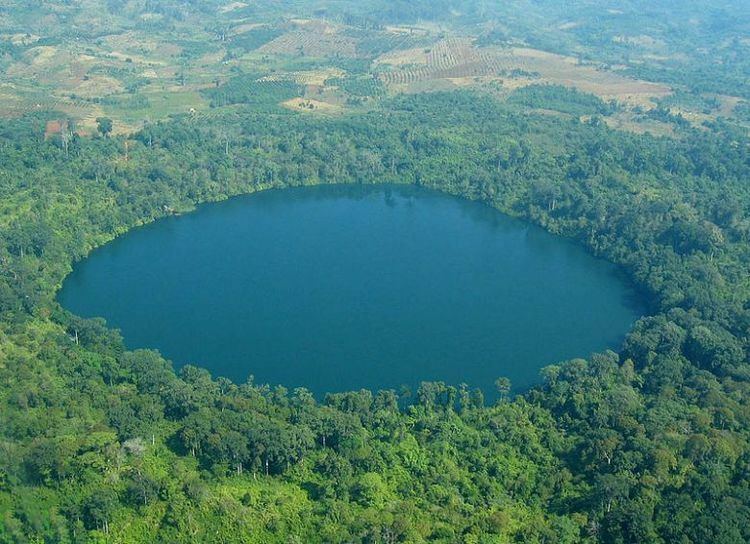 Sekong is split administratively into four districts: Thateng on the Bolaven Plateau, Lamam in the lowland plain, and Dakchung and Kaleum in the mountainous areas bordering Vietnam. The Tad Xe Noi waterfall is located 25 kilometres (16 mi) south of Sekong city. The Sekong River, which divides the province, flows in a southern direction into Cambodia and is navigable for boats. 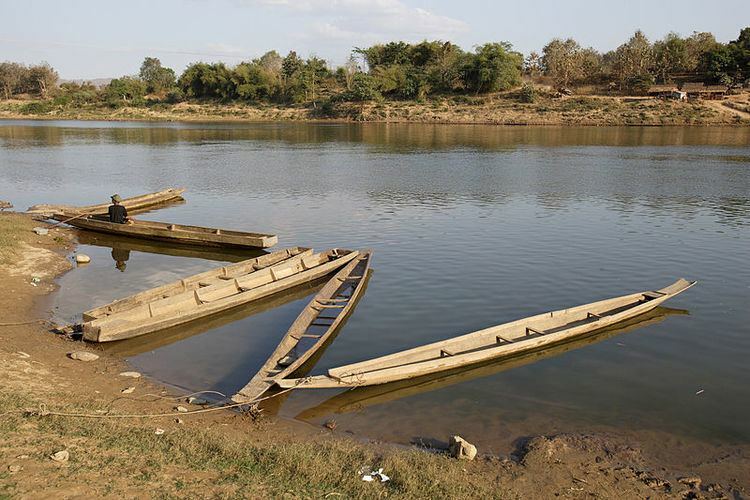 Long-tail boats are navigated though the river along scenic routes on the edge of the Bolaven Plateau. Freshwater dolphins can be seen in the river. Waterfalls are a common feature in the river valley; some of the popularly known falls are the Tad Hia, Tad Faek and Tad Se Noi (or Tad Hua Khon). The most famous water fall is the Nam Tok Katamtok that is located on the Huay Katam River, deep in the forests of the Bolaven Plateau. The Sekong river valley has fertile plains interspersed with paddy fields and fruit orchards. Its rich tropical forest has many rare species of flora and fauna. Sekong is among the most remote areas of Laos; even some of its largest villages are virtually inaccessible by road for at least half of the year. The infrastructure is poorly developed. The eastern districts of Dakchung and Kaleum, in particular, are characterized by mostly mountainous terrain which is rugged and difficult to access. This isolation has meant that forest cover, biodiversity, and ethnic traditions have changed less in recent years than in other areas in Laos. However, the province has become much less isolated in recent years, with the upgrading of a major road up from the Mekong valley city of Pakse, plus two major road projects connecting Sekong to Vietnam to the east. Road infrastructure backed by the Vietnamese is part of a regional development strategy spearheaded by Hanoi called the Development Triangle Initiative, aiming to develop links between Vietnam and neighboring underdeveloped provinces in Cambodia and Laos. The Dakchung Plateau is an Important Bird Area (IBA). It is 5,140 ha in size, and is situated at an altitude of 800–1,400 metres (2,600–4,600 ft) above sea level. The habitat is characterized as pine woodland, grassland, degraded semi-evergreen forest, dry evergreen forest, marshy land, and tall grasses areas. Of the avifauna, the yellow-billed nuthatch (Sitta solangiae) is classified as near threatened, while the black-crowned barwing (Actinodura sodangorum) is classified as vulnerable. Other fauna include the Oriental small-clawed otter (Aonyx cinerea), tiger (Panthera tigris), big-headed turtle (Platysternon megacephalum), and herds of Asian elephant (Elephas maximus). The Xe Sap IBA is located within the Xe Xap National Biodiversity Conservation Area (NBCA); the IBA surpasses the NBCA's 1335 km2 boundaries (established in February 1996). The IBA and NBCA are part of two provinces, Sekong and Salavan. The NBCA sits at an altitude of 400–2,066 metres (1,312–6,778 ft) and is 1335 km2 in size; the highest peak is Dong Be with an altitude of 2,066 m, part of the Southern Annamite Mountains. The habitat is characterized by various forests (dry evergreen, pine, semi-evergreen, and upper montane), as well as grassland. Two species of gymnosperm were recorded. Its key avifauna includes Blyth's kingfisher (Alcedo hercules), crested argus (Rheinardia ocellata), and yellow-billed nuthatch (Sitta solangiae). Other notable wildlife are two types of primates and one turtle species. An unpaved road from Salavan to Ta-Oy and further east to Samuoy runs the northern border of Xe Sap NBCA. But small paths provide approaches from the main road to villages located on the northern part of the NBCA. The southeastern part of NBCA is difficult to reach. However, the Kong River (or Xe Kong, or Sekong) and its two tributaries Xe Sap and Xe Lon provide access to the reserve by boats. The reserve has many water falls, rocky cliffs and rhododendrons at higher elevations. There are 43 mammals (including 18 key species), 178 birds (18 are key species), 48 reptiles and 33 amphibians; the notable species of wildlife are two species of bears, serow, large antlered muntjac, large number of gaurs and tigers. A particular plant species are Pinus dalatensis and Kinabaluchloa species, a genus of bamboo. The Phou Ahyon IBA is 148,900 hectares in size. The IBA altitude varies between 400–2,193 metres (1,312–7,195 ft) above sea level. The topography contains the Phou Ahyon massif (2,193 metres (7,195 ft)), which is the highest and largest massif in the country's southern area. The habitat is characterized by dry evergreen forest, Fokienia forest, and upper montane forest. Notable avifauna includes black-crowned barwing (Actinodura sodangorum), black-hooded laughingthrush (Garrulax milleti), chestnut-eared laughingthrush (G. konkakinhensis), crested argus (Rheinardia ocellata), golden-winged laughingthrush (G. ngoclinhensis), and yellow-billed nuthatch (Sitta solangiae). Sekong is ethnically diverse. Only about 3% of the population is ethnic Lao. The vast majority (97%) come from one of at least 14 distinct ethnic minority groups. The Alak (21% of the provincial population), Katu (20%), Tarieng (19%) and Nge/Krieng (11%) are the main ethnic groups. The Lao government classifies them as “Lao Theung” (mid-slope Lao), but an ethno-linguistic categorization, based on language families, places them under the Austroasiatic family. Within this broad family, the ethnic groups of Sekong fall into two linguistic branches: the Katuic (including the Katu and the Nge/Krieng) and the Bahnaric (Alak and Tarieng). Approximately 14,700 Katu live in the province. Sekong Province is one of the poorest provinces in Laos, second to only Houphanh Province. Infrastructure is poorly developed, with few having access to clean water and sanitation as of 2000, and the literacy rate is extremely low. Sekong Province is one of the most important coffee producing areas of Laos along with Saravane Province and Champasak Province. Sekong Province is Laos' main honey-producing area. Purpose-made tree cavities are a particular tree beekeeping methods practiced in three districts: Dakchung, Kalum, and Lama. Remaining forest cover in Sekong Province is high. Government figures classify over 50% of the province’s land area as forest, the majority of it being mixed deciduous and semi-evergreen forest, but with pockets of dry dipterocarp forest along the Sekong river valley, and pine forest in the Dakchung highlands. Much of the natural forest in Sekong has never been subject to commercial logging, but this is changing fast. Commercial timber extraction has been expanding rapidly over the past decade in the province. There is tremendous and growing pressure on Sekong to log its forests – both from Vietnamese interests (where the wood furniture sector averaged 70% growth per year during 2000–2004) and from Lao companies (who face wood shortages because of dwindling stocks in lowland forests). The economic return from the forest resources of the province, as of 2003, was estimated to be in the range of US $398 to 525 per household, and more than the agricultural income. The revenue to the state from sale of timber was also very substantial, estimated to be US $10.35 per ha. The natural forests in the province are also helpful in carbon sequestration benefits estimated to be US$124 per ha and also in watershed improvements, by way of avoiding erosion and reducing flood incidence. Corruption of the provincial level authorities in Sekong province is a problem, and they have reportedly "actively undermined a successful donor-funded village participatory sustainable forest management initiative." The cultural values in the province relate to: The indigenous Lao Teung culture with spiritual links to the land, five different "Lao Teung" languages with one becoming extinct, several funeral and sacred forests, Indochina War relics, and a stretch of the Ho Chi Min Trail. To ward off falling bombs during the Indochina War, some animist tribal people placed talisman above their huts. Weaving activity in Sekong City has unique textile designs (in mulicoloured lines) and is aided by a back-tensioned loom called the "hip loom". Katu women also apply a warping technique. In addition to the Katu, the Talieng (Tarieng) of Sekong City also use back-tensioned looms, as do the Harlak in Kasangkang village, which is located just outside Sekong City. The men of the Talieng ethnic group wrap a Tha Khatil cloth around their waist as a traditional costume. Among the Mon-Khmer, stripped lines are incorporated into clothing by use of the back strap loom. In addition to geometric stripes, decorative patterns include animals or plants, considered to be traditional motifs, or planes and bombs, which have a historical context. The textiles produced by Nge ethnic group are attractive. Traditional Lao skirts (sin) are a specialty of the Alak group. Also of note are Pha Biang (scarves) and Pha Kaan (head cloth scarves), including turbans, bonnets, hats and diadems. 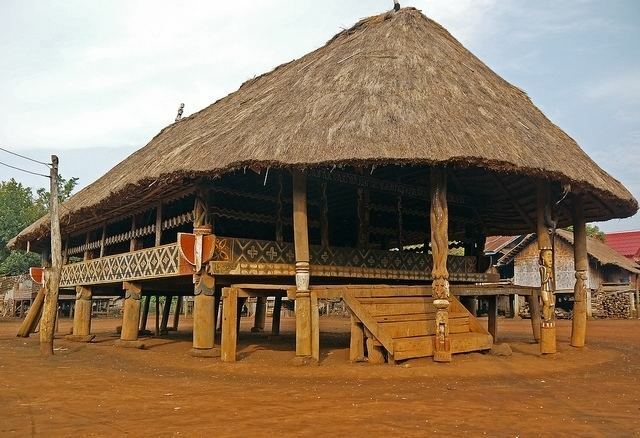 Woodcarvings and traditional longhouses are attractive to see in the Kandone Village.